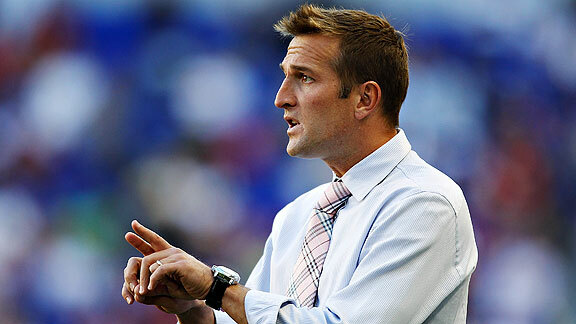 Mike Stobe/Getty Images Jason Kreis has led RSL to an MLS Cup and the CONCACAF Champions League final. It was January 2010 and Jason Kreis had a problem. His Real Salt Lake players had just won the MLS Cup and proved them wrong -- the people who said RSL owner Dave Checketts was nuts for pulling his 34-year-old striker off the field and making him his head coach three years ahead of schedule, without serving an apprenticeship as an assistant. The people who said Kreis was too inexperienced. The people who said he'd never win a championship. The people who said the organization was a joke. The people who said the team lacked firepower, or star power. At 37, Kreis had run out of things to prove. He'd turned a tepid team into a consistent winner, set all kinds of club records and won an MLS championship. So he had to come up with something new. As RSL president Bill Manning recalled: "We're down there in Fort Lauderdale for the combine. And there's various coaches and technical staffs around and Jason makes a comment, completely out of the blue, and says, 'They still don't respect us!'" Kreis wasn't joking. "He was serious and he got himself worked up a little," Manning said. "You could see the intensity in his face." Classic Kreis -- the sort of man so petrified of going at anything less than full out that he sees insults where there aren't any, disrespect where there is only admiration. "Jason creates adversaries in his mind," Manning said. "He creates these little perceived slights, and that drives him. As a player he was too small, and that drove him to score 100-plus goals. As a coach, people were asking how successful he was going to be with no experience. [After winning MLS Cup] he felt the other coaches didn't give us the respect we deserved." So Kreis set about doing what he'd always done: work harder. "It drove him to scout better," Manning said. At that 2010 combine, Kreis' RSL became the first team to conduct de-facto job interviews with all 64 players invited -- a practice a half-dozen other teams have since copied. It was an extension of his policy of meeting with potential new players in a non-soccer setting to get a feel for their personalities. And it was the next step in his tireless quest to maintain an edge over his competition. Kreis first began toiling for edges when he took over from the fired John Ellinger four games into the 2007 season. That had not been the plan. Ellinger was supposed to stay at the helm for several years, while Kreis -- the first player to score 100 MLS goals -- retired and then served as an apprentice. But, explained Checketts: "I needed a new direction badly. We were going nowhere. We had no future and had started the season 0-3-1. People were trying to give me some recycled candidates to work with. But I wanted someone young, someone with something to prove. I had been watching Jason ever since we signed him. I just thought this was a guy who had all the characteristics to be a good coach -- overachiever, got the most out of his abilities, will to win, goal-oriented. I asked him and his wife over to dinner and told him what I had in mind and he told me he wanted to go for it." And so Kreis, then the youngest active head coach in MLS, went for it. "Of course I was nervous about the whole thing," Kreis said. "After doing it a few months, I realized it would be a whole lot harder than I expected it to be." He'd inherited a team that was short on talent. In the first two seasons of its existence, RSL had come nowhere near the playoffs. And it wouldn't in Kreis' first season, 2007, either. 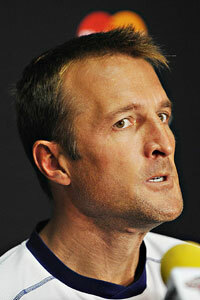 Yuri Cortez/AFP/Getty Images Jason Kreis puts on his game face at a CONCACAF Champions League news conference. "It was definitely a gamble," Checketts said. "But I knew he was going to be a dramatic improvement. And I really knew it when after three weeks into the job he flew down to Argentina and came back having signed Javier Morales and Fabian Espindola." Over the next three seasons, RSL improved markedly, with a slew of new signings meshing nicely. In 2008, it made the playoffs for the first time and was unfortunate not to reach MLS Cup. ("My honest opinion was we should have won it in 2008," Kreis said. "That team was playing unbelievable soccer.") In 2009, RSL scraped into the playoffs but won the conference final and MLS Cup on penalties, making Kreis the youngest MLS Cup-winning coach of all time. In 2010, RSL was eliminated in the first round of the playoffs, but had the second-best record in the league. On Wednesday night, RSL, which is perfect through four games in MLS in 2011 and hadn't lost at home in 37 competitive and friendly games, failed to put the cherry on top of the cake by becoming the first MLS team to win the expanded CONCACAF Champions League. It was a monumental achievement, however, as it set two other firsts: winning its group and making it to the final since the tournament was upgraded from a one-week single-elimination affair. It all sounds like straightforward progress. But calling it that would be underestimating the devotion Kreis has sunk into the process. "He's consumed by his job and performance and winning," Checketts said. When Kreis became head coach, he worked 18-hour days, preparing meticulously for training sessions, upcoming opponents, scouting for the necessary upgrades to his squad and handling every detail concerning his team, down to what they would eat and what airline they would fly. The rest of the time, Kreis worked at addressing his weaknesses, a trait ingrained during his playing career. "When he wasn't good at something, he worked really hard at getting better at it," said Dave Dir, who coached Kreis for five years with the Dallas Burn. "A lot of what you saw in him as a player you see in him as a coach now." As Mike Jeffries, who succeeded Dir at the Burn, recalled: "When [Kreis] got the job as the coach in Salt Lake, the first thing that he did was to call pretty much all the coaches that he'd worked with throughout the years and flew out to meet them to basically just ask questions. In a few hours he picked our brains on how to handle this and that. That was sort of typical for him." The hard work took a toll. "It was very, very difficult on my wife and kids," Kreis said. "Here I had gone from a soccer player, where if I spent four hours at work that was a long day, to going to work at about 6 o'clock in the morning and then get home and need to watch more DVDs." His hobbies, such as golf and woodworking, have fallen by the wayside. "My tools are now very rusty," Kreis said. "I'm an extremely motivated person. No matter what I'm doing, I want to be the absolute best at it. If there's any competition going on -- look out. That's just my upbringing. I'm from a very blue-collar family. Both of my parents grew up on farms in Iowa. "I am very, very focused on my job and am probably thinking about it too much," Kreis said. "Every waking moment I'm not spending making this team better I like to spend with my kids. There's not a whole lot of time focused on the happiness of me. I get happiness from watching my kids play and watching my team play." His dedication has paid dividends. Since MLS switched to a format allowing for tie games in 2000, only one coach, Houston Dynamo's Dominic Kinnear, won more games before turning 40, according to the Elias Sports Bureau. Kinnear, now 43, nabbed 48 wins. Kreis, 38, already has 46. And he won't turn 40 until December 2012. Kreis has done it with a very supportive upper management and, in particular, a general manager, Garth Lagerwey, whom he's known for decades. The two have formed a strong partnership at RSL. Lagerwey has earned plaudits for his transfer savvy and ability to create a very deep squad without breaking the bank, or even paying anybody a Designated Player salary. Kreis, who is never seen doing anything but hollering or scowling along the sideline, has been lauded for playing good soccer and fostering cohesion in the locker room. Kreis treats his players the way he wanted to be treated in his playing days. "He's honest with everyone, and that's just coming from him as a player," captain Kyle Beckerman said. "That was the type of coach he liked, the ones that told it to him straight." And Kreis listens to what his squad has to say. "If we as players feel something isn't right, like training or food, and could be a little different, he's always got an open door for us to come in and express that," Beckerman said. "He's always glad that we bring it to him. That's special to him. I've played under coaches where veterans have come in and brought something to them and been shot down. And once that happens, you lose the older guys and the communication." "A lot of what we do as coaches is salesmanship," said Kreis, whose assistants are all former players. "Sure, there's a certain amount of actual coaching and improving of players you can do, but the majority is relating to them and getting them to buy into what you want. If you can't relate to your players, how in the world are you going to sell them a message? We're young enough that we've played with a lot of these guys and that they've seen us play and we've walked in their shoes." That closeness hasn't yet been fully exploited. There's still untapped potential there, Kreis said. "We're not there. I'm after perfect, and I'd like to see how close we can get." As for Kreis' own ceiling, he is unapologetic about his ambitions, which includes eventually taking over the reins of the U.S. men's national team. "The ultimate goal for any soccer player is to play for his national team," he said. "The ultimate goal for any coach is coaching the national team." But before he gets there, Kreis still has more critics -- whether real or imaginary -- to prove wrong.